If we discovered life on another planet, the first thing we’d do is send a probe to begin a systematic survey of life on that world. Who knows what kind of weird organisms we’d find? Such a survey is a rational thing to do because the scientific payoffs would be huge. However we have yet to do that on our own home planet. According to various estimates we have discovered only between 1% and 30% of the living species on Earth. Numbers are hard to pin down, in part because the definition of a species gets fuzzy when talking about the most common form of life on earth: bacteria. However, the most reliable current estimate says we have discovered 3.7 million out of 30 million on the planet, or 10%. Any way we count it we are ignorant of the vast majority of the other organisms co-inhabiting this globe. Because humans have never done a systematic survey, nearly all these creatures have been discovered in serendipitous encounters by poking around here and there. Still, every year biologists finds new, strange and surprising species – often ones significantly different from what we already know. There may yet be surprises, but if we chart the varieties of life we have so far discovered on Earth, they fall into six broad categories. Within one of these six categories, or kingdoms of life, all species share a common bio-chemical process and genetic makeup. Six kingdoms is not the only way to group all species. Some researchers divide all into ten or eleven, some find 20 or more subgroups, and a few cling to the old three, four or five. But the current consensus holds that earthly life clusters into six major groups. Three of them are the tiny microscopic stuff: first, ancient primitive one-celled organisms, called archaea. Second, eubacteria, or common bacteria. And third, the protist, a diverse group of bacteria-like organisms that don’t fit into the other five categories. The other are the three kingdoms of organisms we normally see: fungi (mushrooms and molds), plants, and animals. Every species in the six kingdoms, that is every organism alive on earth today, from algae to zebra, is equally evolved. Despite the differences in the sophistication and development of their forms, all living species have evolved for the same amount of time: 4 billion years; all have been tested daily, and have managed to adapt across hundreds of millions of generations in an unbroken chain. Many of these 3.7 million organisms have learned to build structures with their bodies or out of their own bodies. Termites build towering mounds up to 6 feet high, bacteria form dense aquatic mats, birds and some mammals build elaborate nests. These structures are built from plans hardwired into the organism’s genes. Without too much exaggeration, these artifacts can be thought of as an extension of their body, because like a body, they are a physical manifestation of a genetic code. Viewed this way, stuff that organisms make are extended bodies, or what science calls extended phenotypes. They are the stuff that genes build. One of the species on earth – homo sapiens – makes a lot of stuff. Like termite mounds or colony bird nests, this stuff appears to be an extension of animal bodies. In broad strokes this is the stuff we call technology. Marshall McLuhan, among others, have noted that clothes are people’s extended skin, wheels extended feet, camera and telescopes extended eyes. Our technological creations are great extrapolations of the bodies that our genes build. In this way we can think of technology as an extended phenotype. During the industrial age it was easy to see the world this way. Steam-powered shovels, locomotives, television and the levers and gears of engineers were a fabulous exo-skeleton that turned man into superman. A closer look reveals the problem with this view: the extended phenotype of animals is the result of their genes. They inherit the basic blueprints of what they make. Humans don’t. The blueprints for our stuff stem from our minds, which may create something none of our ancestors ever made or thought of. If technology is an extended phenotype of humans, it is a phenotype not of our genes, but of our minds. Clearly technology is not built by inheritable genes but by spontaneous ideas. Technology is the phenotype of mind. It is the body for ideas. And what is remarkable about this body is that taken as a whole, it resembles the phenotype of biology. While there are some differences, the evolution of technology mimics the evolution of life. The two share many traits: Both evolutions move from simple to complex, from generalism to specialism, from uniformity to diversity, from individualism to socialism, from energy waste to efficiency, and from slow change to greater evolvability. Technology, like biology, moves toward greater diversity, socialism, complexity, efficiency and evolvability. We might think of it as a type of life. Indeed, the way that specific technologies change over time fit a pattern similar to a genealogical tree of species evolution. One idea births many similar offspring ideas, which in turn lead to various related ideas for the next generation of technology. But instead of expressing the work of genes as in nature, technology expresses the ideas of our mind. Or, it has until lately. The entire system of technology is now so complex that it forms a tangled ecology of ideas and devices which support each other. Human mind, so essential for its birth, play a decreasing role. Most of the communication traffic in the world is not humans speaking to humans, but machine speaking to machines. Computers are major co-designers of computers; it would be impossible to design the next generation of computers without computers. Artificial expert systems and embryonic AI are essential partners in large scientific experiments. Little new technology is able to thrive outside the ecology of other technology. There is a real sense in which the ideas underlying the phenotype of outward technology are no longer just the thoughts of humans. More and more technology is an extension of tiny, autonomous bacterial level impulses that originate in the technological system itself. In this way, technology has become the seventh kingdom of life. In addition to archaea, protists, eubacteria, fungi, plants, and animals, we now need to add the technium. The technium branches off from the mind of the human animal, just as the deepest roots of the human branch off of the bacteria. Outward from this root flow primitive species of technology like hammers, wheels, screws, and refined metal, as well as domesticated crops. Over time the technium has evolved the most complex rarefied species like quantum computers, genetic engineering, jet planes, and the world wide web. Life and technology traced back to a common stock. All seven kingdoms of life share the same remarkable ability to maintain disequilibrium, to increase extropy, and to accelerate evolution. You forgot viruses .. as they are usually not counted as being real life: they depend on other life for doing everything. Likewise for the technium. Only that memes cannot even reproduce themselves, or do something. Memes & ideas depend totally on an available humans to copy, mix, create ideas. Even the realisation of ideas depends totally on the human substrate. Are memes like viruses? In one sense they clearly are: we will not easily give them the status of ‘life’. Blueprints for the stuff we created may not come from our genes but I believe that our profound motivation to create do come ultimately as a result of the influence of our genes. We build stuff ultimately to improve our ability to reproduce and thrive as an individual and thus as a specie, although the proximate reasons of our creations may seem unrelated. It is mostly an unconscious and some time distorted process but I think creation and technology can be seen on some ways as an extended phenotype of human genes. Your major assumption demands the acceptance of a common definition of life. I can’t agree that technology in general, and AI in particular meet all biological definitions of life that are necessary to be included as a “Kingdom”. It is of course a biological definition which is necessary since the taxonomical organization of the biotic world is the purpose and context for Kingdoms and all inclusive taxonomy. “Living organisms are autopoietic systems: self-constructing, self-maintaining, energy-transducing autocatalytic entities” in which information needed to construct the next generation of organisms is stabilized in nucleic acids that replicate within the context of whole cells and work with other developmental resources during the life-cycles of organisms, but they are also “systems capable of evolving by variation and natural selection: self-reproducing entities, whose forms and functions are adapted to their environment and reflect the composition and history of an ecosystem” (Harold 2001, 232). While AI systems may provide insight to the mechanisms of subsets of self-reproduction, self-organization, and modification of replication responses to the environment, they are not yet completely autonomous self replicating and organizing systems (the pull-the-plugs problem). Living things are made of cells – this is part of the definition of life. Technology is not a living thing and should not be a 7th ‘kingdom’. If you are trying to convince us that technology should be a kingdom, first you need to deal with the definition of a living thing. While AI systems may provide insight to the mechanisms of subsets of self-reproduction, self-organization, and modification of replication responses to the msn nickleri environment, they are not yet completely autonomous self replicating and organizing systems (the pull-the-plugs problem). To illustrate my problem with this statement, let me replace a couple of words. Many scientists do use that definition, and thereby leave out viruses as non-living, or quasi-life, perhaps, but surely, even though they cannot do much without a host, they are alive. Our definition of life extends over much of the organisms that stem off from our original ancestor and ignores anything else that may be living that doesn’t quite fit in with that. Maybe we should loosen the definition of life, as then we’d be more likely to find it. 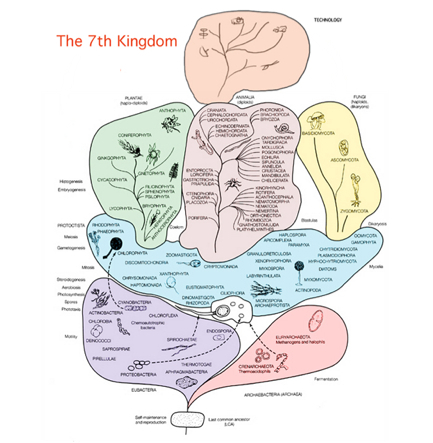 The 7th Kingdom of Life is called Technia. The fact that the commentors are getting caught up in the definition of life is irrelevant. What is important and relevant is that throughout the history of life information on what behaviors any given entity ought to exercise has remained confined to the medium of DNA. With the advent of the meme, or the idea, information on what behaviors the human entity ought to exercise began to be encoded in a different medium, namely the memory of any given individual and secondarily in collective memory of any given people group (the oral tradition). This allowed for a new phenotype to come into existence… not the phenotype of the gene encoded in DNS but rather the phenotype of the meme encoded into the “idea-space” of the collective human mind. This is a fickle and transitory medium, but it marked the birth of the meme (instructions on how the world ought to be manifested encoded in the collective human consciousness). The more recent and significant change in where the instructions for life are encoded was really the advent semi-permanent medium. I believe the original medium was stone which gave way to paper, which gave way to magnetic tape, which gave way to magnetic disks, which are giving way to optical disks. Whatever the case, the fact remains that currently instructions on how an entity ought to exist are now encoded in a medium completely outside of the human mind and executed regularly in a context outside the human mind (encoded in hard disks and executed by computers). I am a systems administrator so I will be the first to tell you that this new Kingdom would certainly fall apart if human beings all disappeared tomorrow. To me, however, life is really just the execution of encoded instructions. The fact that the instruction used to be encoded in DNA and executed by RNA.. and now it is encoded in UFS and executed by PHP is moot. The medium is changing and the compiler is changing, but the basic definition of life is not. I disagree with the idea that the Technia is not a new Kingdom of life based upon any classic definition of life and I agree with Kevin that we need to start analyzing and classifying the different subsets of Technia. Where can I find a larger image of this? I’d like to be able to read it! “All seven kingdoms of life share the same remarkable ability to maintain disequilibrium, to increase extropy … ” Decrease entropy? There is nothing remarkable about increasing it. Memes are not technology, but a form of art/expression.